With summer around the corner and the kids hanging around the house I was looking for some healthy and low fat snacks to keep around. I was thinking that homemade popsicles are better than any store bought ones. There really isn’t anything you can’t put in the mix. Anything you put in a smoothie you can put in a popsicle. I like to add honey in everything so its great in popsicles. I think you can even sneak some pureed vegetables mixed with sweet fruit like apples in a popsicle. 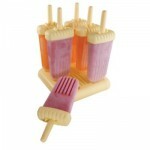 It is important to look for some popsicle molds that are BPA free Here are a couple ideas I found. How: Peel the bananas. Cut them in half, widthwise, and push a Popsicle stick through the cut end of each half. Spread peanut butter on the bananas, and then roll them in the nuts, cereal, or seeds. Wrap them in waxed paper and freeze for three hours. Blend till smooth. Pour into molds and freeze. Made 12 – 2.5 oz. popsicles. a tablespoon of honey and 1/2 cup small wild blueberries. Do you have a recipe your kids love. Let us know. We will put it up here.